Being a Brownie is a huge adventure and your Brownie Adventures book has everything you need to make it the best one you've ever had. Inside you'll find loads of exciting ideas and activities to help you work towards your Adventure, Adventure on and More adventures badges, as well as a special Brownies Go For It! challenge that will get you ready for Guides. And you will love doing the quizzes and puzzles along the way! 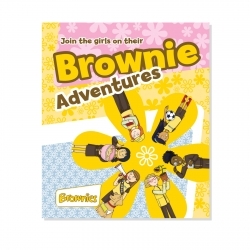 The Brownie Adventures book is fully illustrated throughout and includes three sheets of stickers. Size: 160 pages wire-o bound paperback (210x180mm).